The demand for local food continues to grow, often faster than small growers and infrastructure can keep up. That’s why the work of the Northwest Agriculture Business Center (NABC) is vital in connecting small farmers to big business in Northwest Washington State. Founded in 2006, NABC is the brainchild of a group of farmers and politicians who noticed a gap in the small business assistance market. Independent growers running small farms are first and foremost farmers. Brand development, marketing, establishing a customer base and utilizing accounting technology are often unfamiliar and time consuming aspects of the small farm business. NABC provides assistance in these and other areas helping to keep small farms viable. 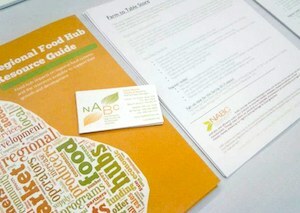 “So what we do at NABC is recruit farmers who are ready for wholesale. They are experienced farmers but they need a little more assistance to identify customers that want their product,” says Lucy Norris, Marketing Director at NABC. She further explains how NABC bridges the gap between buyer and supplier through educational outreach, marketing assistance and the creation of rural cooperatives and food hubs. NABC works with new and established farms and agriculture-based businesses in the hope of preserving farmland in Washington State. By reviewing business plans and assessing the viability of integrating farm products into the local marketplace they can help farmers find the right path for their business. A lot of the work NABC does involves connecting the right product to the right customer. When you step away from the world of farmer’s markets and traditional CSAs it’s surprising what companies are looking for local food connections. In Washington State, sustainable agriculture is moving beyond local restaurants and grocery stores and expanding into larger institutions. Norris explains that NABC connects local farmers with daycares, schools, manufacturers, senior centers, organizations working with the lower income population and hospitals. Many area hospitals feature farm fresh products on their menus creating relationships with local businesses and engaging staff and patients in healthy eating practices. One of the leading issues for small farmers is a lack of infrastructure. Big Ag has long enjoyed the vertical integration of their products, but efficient delivery systems, pick up points and accounting technology are still necessary for independent growers to connect with their target markets. In order to lay the foundations of infrastructure, NABC helps farmers establish food hubs. By transporting products from several farms to one large customer at once, the carbon footprint of the farms involved is decreased and the customer can enjoy the same efficiency of service as they get from their larger suppliers. Although NABC offers several fee-based business planning services they do receive grant money at the state and federal level that helps reduce the risk and the cost to the farmers in their food hub network. A part of their food hub infrastructure is streamlined accounting technology. A three percent margin on credit card transactions is the only real cost to the farmer that utilizes the food hub program. This makes the program accessible to a large number of farmers regardless of the number of acres they work (and in Washington State that ranges from a few hundred to just a few acres). NABC has begun offering sponsorship opportunities to area businesses to help increase their funding. If you speak to any independent grower they’ll tell you the importance of staying educated and up to date on sustainable agriculture practices and the latest in agriculture politics. NABC provides regional farmers with a full schedule of workshops and classes that lead to certification in farming techniques and small business planning. Their curriculum works in tandem with an agriculture business planning course offered by Washington State University. WSU also offers information on farm succession planning which is key to the state’s continued farming success. The idea is to educate farmers so they can better help their farms and inevitably sell their products. In addition to helping farmers find their clients and providing educational opportunities, NABC has a large subscription based network that keeps farmers in the proverbial local business loop and promotes their farm and products. NABC tries to keep its members informed of the latest happenings at both the state and federal level in regards to food and agriculture. There are approximately 10,000 small farms in the NABC’s catchment area and currently 200 farms subscribe to the network. NABC continues to grow, reaching more and more farmers annually. Creating infrastructure is essential to the establishment of wholesale customer-independent farmer relationships. The work of NABC can be duplicated in other states. Norris explains that the first step is cooperation. “We are interested in helping farmers work together. We believe there’s a lot of potential for that because small growers and medium scale growers on their own are having a harder time meeting the demands there are right now for local food. The demand for local food is rising faster than the supply. But if farmers across the country can change their way of thinking towards the farm cooperative idea, whether or not that’s a legal farm co-op or working together to pool resources, to share aggregation or marketing together, then they can really meet that demand head on,” concludes Norris. Educated consumers demand locally grown fresh food. By replicating the work of NABC and others like them across the nation, independent growers can help build a nationwide infrastructure that will support the ever growing world of sustainable agriculture.